Multiple reasons and excuses explain the lack of recent postings. But I won't waste your time with details. I will just make an effort to get back to a more regular blog posting schedule, and maybe the happenings of the last several months will somehow come to light. It was a sunny, hot summer and wild flowers and goldenrod were in profusion. The bees took good advantage of them and produced some of the tastiest honey ever. At the end of summer, Don shared his knowledge and experience at the Tunrbridge World's Fair at the Vermont Beekeeper's Association Table. Two of my hens passed away this week. Both were from my second batch of chicks, three springs ago. So they had already given me the best of their laying days. I discovered this little gal not feeling very well a couple of weeks ago. While I am not totally sure of the identity of the Golden Comet that died, I can say, her final days were spent in a comfortable spa setting where she extended her life by several days. 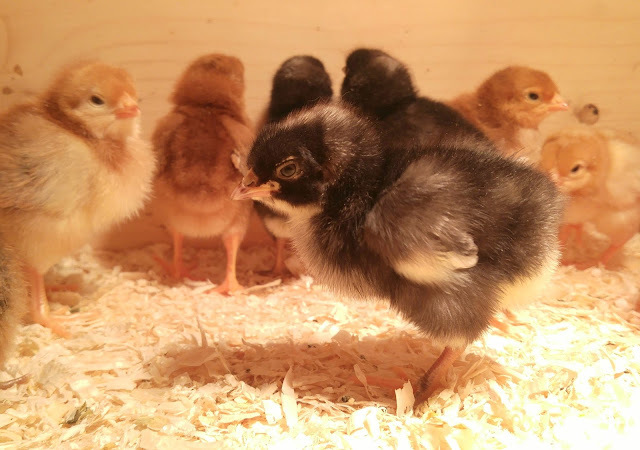 In the end, I returned her to her flock mates in a special, heated brooder. She seemed very happy to be back with the girls, but she lasted there not even over night. Here is a photo of her enjoying a sitz bath in the slop sink. She liked the warm water. I love all my hens, but Dottie was a favorite. For a little bird she had such personality and character. She loved to free range and was always the one to find the hole in the fence and get out. 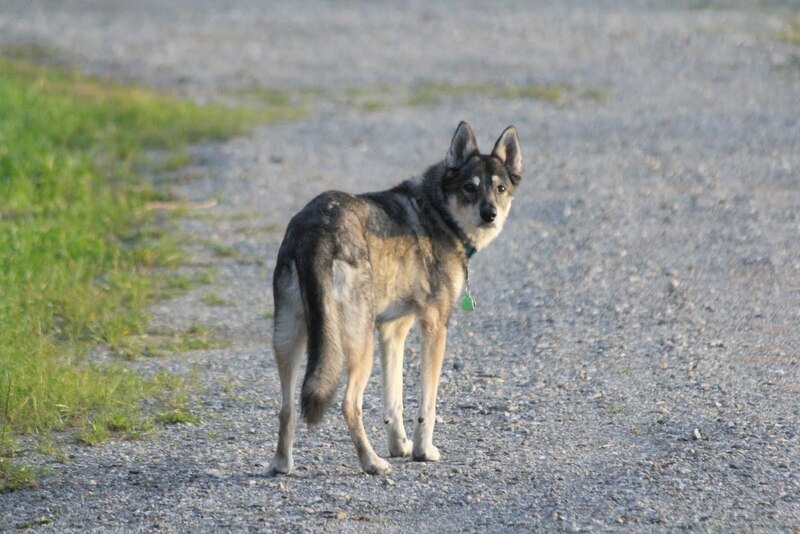 We spent lots of time putting her back into the chicken yard and tracking down the holes to mend. Here she is, trying to share some of Don's lunch. 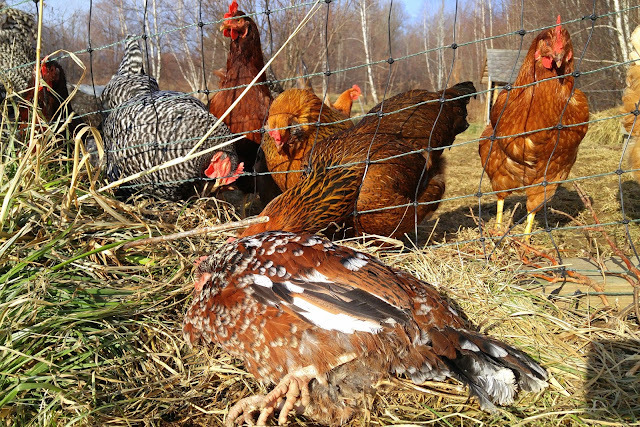 One time Maurine saved her from a fox that had her by the tail feathers.....the dangers of sneaking out of your coop! Two days ago I found her in the morning, lying listless in the yard, very cold. I moved her out of the fenced in area so her mates wouldn't disturb her and placed her next to them, in the warm sun. Her hen friends came over to say good-bye. I went down several hours later, after dusk, and she was still lying there and alive. So I brought her into the house and put her on some comfy warm towels where she died the next morning. I will miss little Dottie. Either way, I don't think the bees care. The flowers are great sources of nectar for bees and butterflies So in less than a month, we'll have lots of goldenrod honey. It's a little darker and a little stronger in taste than our earlier summer wildflower honey, there is a slightly spicy taste. The honey is truly delicious... warm and sweet ....a great antidote to the shorter and colder fall days. 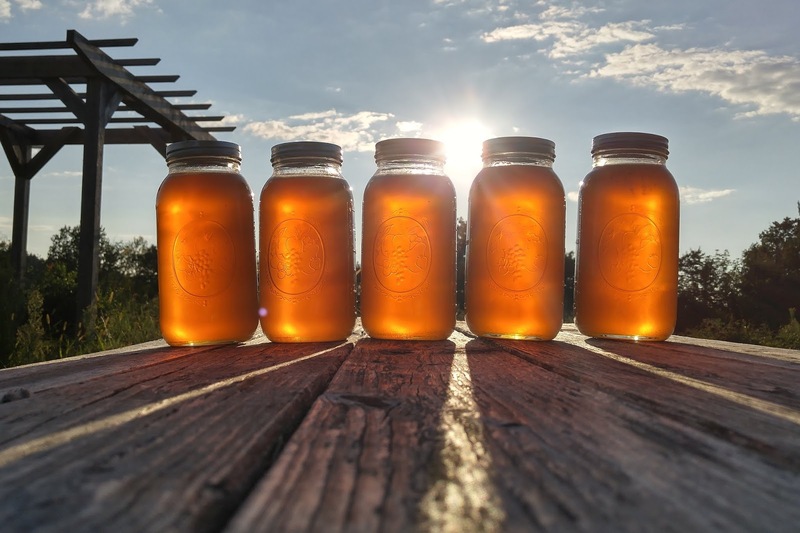 Goldenrod honey does tend to crystallize faster than clover honey or other wildflower honey. Crystallization does not change the flavor or ruin the honey. If you want liquid honey, it can be gently warmed by placing the container of honey in a bowl of hot water until it liquefies. Never microwave honey. This destroys the nutritional value of the honey. Crystallized honey may also be used "as is". A slightly crystallized honey is easier to spread on toast anyway. Saturday and Sunday March 25th and 26th from 10 to 5. Learn about turning maple sap into maple syrup and try some fresh from the evaporator. We hope to see you there! 71 degrees and the sap is flowing like it's late March. New tap holes are drilled each year, strategically placed to prevent hurting the tree from where taps have been in previous years. All tubing and tapping must be approved by the dog. And then the sap joins the main, black line and heads to the collection tank at the bottom of the hill. Preseason's the time to catch up on advances in sugar making techniques and tools. So, Pat and Don attended the Addison County Maple Sugar Maker's Annual Convention in Middlebury. They listened to lectures on 3/16th tubing, tapping below the lateral, the State certification program and more. They also were able to talk with lots of local sugar makers over lunch and at display booths. 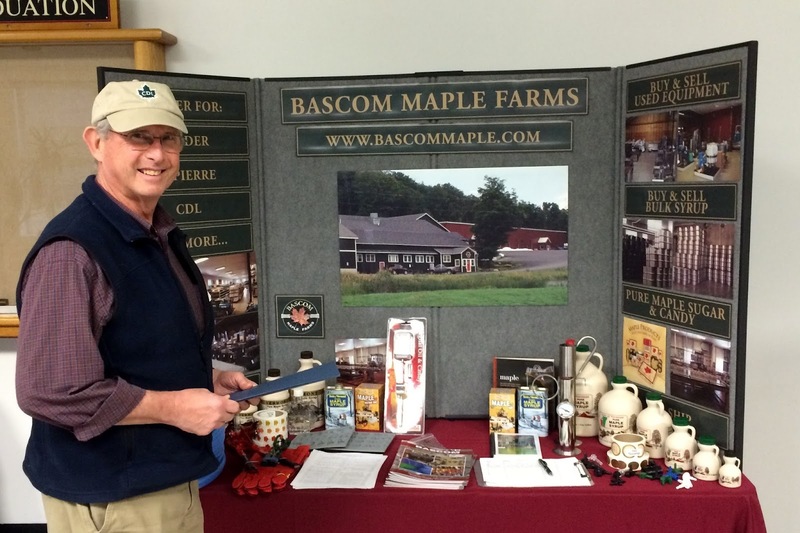 Here, Pat picks up some literature from Bascom, one of Vermont's biggest sugar making operations. Capping each honey filled hexagonal cell of the honeycomb is a bit of golden wax. For us to harvest the honey, Don carefully scrapes off the wax 'caps' with a hot planer. We save all those wax caps, clean them up a bit by heating and filtering out the stray honey or other debris that may have gotten caught up in them. Then the wax gets melted and molded into beautiful golden blocks that are saved to use for making candles, lip balm, soaps, massage bars and other sumptuous creations. In the middle of winter, when farm work slows down and the bees have been wrapped up tight, is when I have time to mix up some silky lip balm from the saved wax. Using a recipe calling for beeswax, sweet almond oil, castor oil, shea butter and cocoa butter, I melt together a a luxurious concoction in a steamy water bath. When everything is liquid and uniform, I pour it into little 1/2 ounce tins and let it cool. The resulting lip balm is just the perfect thing to protect your lips from the drying winds of winter. When you put it on, it's barely- honey scented aroma sits right under your nose, reminding you of summer! All set up and ready to sell to the folks coming to The Richmond Holiday Market on Saturday, December 3rd. It was such a busy day, that this is the only photo I was able to take. 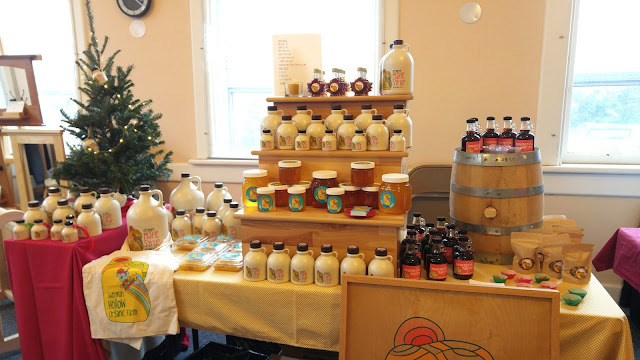 After the doors opened, people were coming by, tasting syrup, inquiring about the honey comb, buying presents, and just enjoying the holiday market. Outside were roaming carolers, draft horse drawn wagon rides, and lots of food and music and plenty of snow flakes. It was a fun and lucrative day and it felt great to know some syrup and honey were going to make their way into Christmas stockings and under trees. Merry Christmas! The honey they could spare has been extracted, the rest left to feed the dormant foragers through their long winter indoors. Then the hives were wrapped and insulated to help them keep as warm as possible. See you in the spring, bees! to fire that evaporator once the sap starts to flow next spring. Don decided if he had to mow the fields anyway, he might as well make hay. He tracked down lots of used equipment, talked to local farmers on 'how-to' and then went to making hay. His first hay sale was to a mother-of-the-bride, who wanted hay bales for hay rides at the wedding! That sounds like a pretty fun start to the haying business. An 'all in one' attachment collects the grasses, packs it into a tight square, wraps it in baling twine, and spits it out. Ivy, the Corgi pup and the new farm creature added to the menagerie, gets an up close introduction to the baby chicks that she's been hired to care for when she's old enough for the job. good 'ole Nike, we miss you! good old Cicely, we miss you!